Genetic parameters for longitudinal behavior and health indicator traits generated in automatic milking systems Genetic parameters for longitudinal behavior Laura Viviana Santos et al. Genetic (co)variance components were estimated for alternative functional traits generated by automatic milking systems (AMSs), and reflecting dairy cow behavior and health. Data recording spanned a period of 30 days and included 70 700 observations (visits to the AMS) from 922 Holstein cows kept in three German farms. The three selected farms used the same type of AMS and specific selection gates allowing “natural cow behavior on a voluntary basis”. AMS traits used as behavior indicator traits were AMS visits per cow and day as binary traits, with a threshold for equal to or greater than three visits (VIS3) and equal to or greater than four visits (VIS4), knocking off the milking device with a threshold of at least one udder quarter, also as a binary trait (KO), milking duration of each AMS visit in minutes (DUR), average milk flow in kg min−1 (AMF), and the interval between two consecutive milkings (INT). Electrical conductivity (EC) of milk from each udder quarter and in total was used as a health indicator trait. For genetic analyses, in univariate and bivariate models, linear and generalized linear mixed models (GLMMs) with a logit link function were applied to Gaussian distributed and binary traits, respectively. The heritability was 0.08 ± 0.03 for VIS3, 0.05 ± 0.05 for VIS4, 0.03 ± 0.03 for KO, 0.19 ± 0.07 for DUR, 0.25 ± 0.07 for AMF, and 0.07 ± 0.03 for INT. 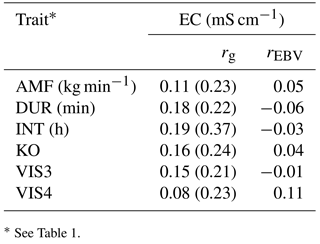 Heritabilities for EC varied between 0.37 ± 0.08 and 0.46 ± 0.09, depending on the udder quarter. On the genetic scale, an increased number of AMS visits (VIS3 and VIS4) were associated with an increase of KO (rg= 0.24 and rg= 0.55, respectively). From a genetic perspective, high-milk-yielding cows visited the AMS more often (rg= 0.49 for VIS3 and rg= 0.80 for VIS4), had a faster AMF (rg= 0.40), and shorter INT (rg= −0.51). When considering these traits as behavior indicator traits, selection of cows with desired temperament simultaneously increases milk yield. An increase of automatically and objectively recorded AMS traits with moderate heritabilities justifies modifications of dairy cattle breeding goals towards higher emphasis on behavioral traits, especially when developing specific robot indices. Nevertheless, ongoing research in this regard with a larger data is suggested in order to validate the results from the present pilot study. Santos, L. V., Brügemann, K., Ebinghaus, A., and König, S.: Genetic parameters for longitudinal behavior and health indicator traits generated in automatic milking systems, Arch. Anim. Breed., 61, 161-171, https://doi.org/10.5194/aab-61-161-2018, 2018. Over the past century, dairy cattle breeding has strongly focused on the improvement of production efficiency to satisfy growing consumer markets that demanded animal products at a low cost level (Oltenacu and Algers, 2005). More recently, the importance of functional traits such as fertility, longevity, and conformation has gradually increased in dairy cattle breeding (Miglior et al., 2005). Today, the economic competitiveness of the dairy industry is directly related to public acceptance of breeding techniques (Oltenacu and Algers, 2005). Increasing consumer demands towards animal welfare are forcing dairy breeders to further integrate trait categories that reflect animal health and behavior. Genetic improvements in animal behavior or temperament might contribute to correlated response in other functional traits. Temperament in response to human handlers (docility) has been used as a criterion for genetic selection in beef cattle (Le Neindre et al., 1995). In several countries, subjectively scored dairy cattle temperament is included in breeding indices (Pryce et al., 2000). However, due to challenges in time-efficient and objective trait recording, assumed low heritabilities as well as difficult economic evaluations, only a few studies addressed dairy cattle temperament from a quantitative-genetic or breeding goal perspective (Gutiérrez-Gil et al., 2008; Jensen et al., 2008; Haskell et al., 2014). Accelerated installation of novel automated technical systems (e.g., automated calf feeders, cow activity monitors, and automatic milking systems (AMSs)) contributes to a growing amount of currently unused “big data”, including phenotypes for health and behavior traits (Barkema et al., 2015). So far, regarding dairy cows' behavior, behavior traits used in official genetic evaluations include the temperament in the milking parlor based on a subjective farmer scoring system (Sewalem et al., 2002). Novel technologies, like AMSs, allow for automatic, repeated measures and objective phenotypic data recording. Behavior phenotypes can be subjectively scored or can be objectively measured with technical devices, e.g., the number of escapes, flight times, or AMS visits (Gutiérrez-Gil et al., 2008; Café et al., 2011; König et al., 2006). Milking and cow traffic records from AMS might also be suitable indicators for the development of novel behavior and milking efficiency traits (i.e., milking duration of each AMS visit in minutes (DUR) and average milk flow (AMF)). Due to their already existing importance, in general, as well as special breeding goals for AMS herds, traits like temperament and milking efficiency are turning into the main focus (Vosman et al., 2014). Regarding animal health, electrical conductivity on an udder quarter basis might be a valuable predictor for clinical mastitis (Fernando et al., 1982). To sum up, moderate to high heritabilities of objectively recorded behavior and health traits offer an interesting and currently unused potential to improve and enhance already implemented genetic evaluations for milkability (i.e., average milk flow), milking efficiency and udder health traits. Utilization of traits directly generated from the AMS could help to improve the German Holstein AMS breeding index “RZRobot”. Until now, the RZRobot has been based only on the following indicator traits from official recording schemes: milking speed, somatic cell count, the overall type trait component for “feet and legs”, udder component score, rear teat placement, and teat length (DHV, 2014). The aims of the present study were (1) to estimate genetic parameters for dairy cow behavior and health indicator traits generated in AMS, (2) to infer genetic relationships among those novel traits with production traits such as total milk yield per day, and (3) to estimate genetic parameters for milk yield and electrical conductivity from different udder quarters. Table 1Definition of the traits generated in the AMS and an explanation for their use as behavior and health trait indicators. Data recording spanned a period of 30 days and included 70 700 AMS observations (i.e., individual visits into the AMS) from 922 Holstein cows kept in three German farms. The requirement for farm selection was the utilization of the same AMS system: “FeedFirst” (DeLaval GmbH, Glinde, Germany) with a selective guided cow traffic and a similar herd size (∼ 300 cows). Selective guided cow traffic combines the advantages of both free and guided cow traffic, allowing the cows to show their “natural” behavior (Umstätter, 2002; Harms and Wendl, 2004). Hence, for the additional AMS visit beyond the typical herd average, it was assumed to be the cow's own decision to enter the milking system. In “FeedFirst” systems, cows have free access to the feeding area by one-way gates from the lying area. However, in order to reach the lying area from the feeding area, the cows have to pass a selection gate that directs the cows to the milking station or the lying area depending on the milking permission. With regard to the diets, all cows entering the AMS received concentrates, depending on the current milk yield level. Hence, the motivating component for all cows to visit the AMS was the same. If the time since last milking is long enough and a milking permission has been established, the cow is directed to the waiting area in front of the milking unit. If the cow has no milking permission, she is directed back to the lying area. With preselection, daily fetch rates are, on average, 1 to 5 % of the herd (Harms and Wendl, 2004). Pedigree data were traced back to 1940, including 22 714 animals, and a total of 297 different bulls with daughter records. The most influential sire had 37 daughters, and the average number of daughters per sire was 2.99. Two different datasets were merged. The first dataset included traits recorded in close intervals, leading to a longitudinal data structure for novel behavior (temperament) and health indicator traits (Table 1). 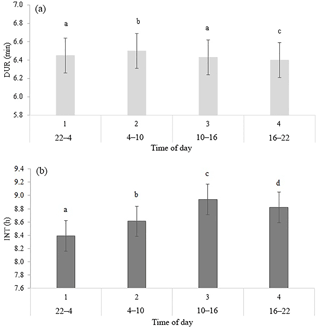 The AMS traits used as behavior indicators were AMS visits per cow and day defined as two binary traits, with thresholds for (i) more than three visits per day (VIS3) and (ii) more than four visits per day (VIS4). If a cow had values equal to or above the threshold, she received the score “1”; otherwise, a “0” was assigned. Hence, VIS3 and VIS4 were defined as binary traits to emphasize the “extra” voluntary component, i.e., the additional AMS visit beyond the typical herd average. Usually, in selective guided cow traffic systems, only cows that voluntarily visited the AMS once per day are fetched and forced by the farmer to visit the AMS at least twice a day (Ketelaar-de Lauwere et al., 1998). Since fetching is time-consuming, we argue that farmers do not force the cows to visit the AMS more than twice a day, and that cows visiting the AMS at least three times a day (VIS3) do that on a voluntary basis due to food motivation or udder pressure (Nixon et al., 2009). Cows visiting the AMS more than four times a day (VIS4) may have other motivations than the primary motivation of being rewarded with food, such as curiosity. Further temperament traits were the knock off of the milking device (KO) from at least one udder quarter, also defined as a binary trait, milking duration of each visit in the AMS in minutes (DUR) and average milk flow in kg min−1 (AMF). DUR and AMF primarily reflect the same aspects of behavior and are also influenced by udder pressure and udder morphology. The traits VIS3 and VIS4 are affected by some common aspects, i.e., food motivation and udder pressure, but also temperament. KO due to stepping and kicking potentially reflects different important aspects of behavior, i.e., discomfort, nervousness, and fear (Rousing et al., 2004). The interval (INT), defined as the time span between two consecutive milkings, was used as a behavior and social dominance indicator (Table 1). A second AMS dataset included measurements for total milk yield per day (MY_total) and electrical conductivity (EC) of milk. Data for milk yield and EC were also available on an udder quarter basis: milk yield for the front left quarter (MY_fl), for the front right quarter (MY_fr), for the rear left quarter (MY_rl), and for the rear right quarter (MY_rr). Abbreviations for EC for each quarter were EC_fl, EC_fr, EC_rl, and EC_rr. Electrical milk conductivity was used as a health trait indicator reflecting the udder health status of individual udder quarters. where y was the vector of observations; β was the vector of fixed effects including parities from 1 to 5, the day when the cow entered the AMS, days in milk in classes according to Huth (1995) (< 14 days = 1, 14–77 days = 2, 77–140 days = 3, 140–231 days = 4, and > 231 days = 5), time of day classes (ToD) when the cow visited the AMS (22:00–04:00 LT = 1, 04:00–10:00 LT = 2, 10:00–16:00 LT = 3, and 16:00–22:00 LT = 4), and explicitly for DUR-specific INT classes (< 8 h = 1, 8–10 h = 2, and > 10 h = 3); X was the corresponding incidence matrix for fixed effects; u was the vector of random cow effects for repeated measurements with the corresponding incidence matrix Z; and e was the vector for random residual effects. A strategy of using an average information (AI) matrix is shown to be computationally convenient and efficient for estimation of variance components by restricted maximum likelihood (REML) in the mixed linear models (Gilmour et al., 1995). In this regard, model I was extended by including the pedigree based on the genetic relationship matrix. Variance components and heritabilities for behavior, health, and production traits were estimated via single-trait animal models using the AI-REML procedure, as implemented in the DMU software package (Madsen and Jensen, 2000). where y was the vector of observations, β was the vector of fixed effects with the corresponding incidence matrix X, u was the vector of random genetic effects with the corresponding incidence matrix Z, and p was the vector of random permanent environmental effects with the corresponding incidence matrix W, and e was the vector of random residual effects. Traits and their corresponding effects as considered in models I and II are given in Table 2. Table 2Significance of fixed effects and of covariates for the different traits. * P < 0.05 significant. ** P < 0.01: very significant. *** P < 0.001: highly significant. n.s. : not significant. 1 MY_fl, _fr, _rl, and _rr: milk yield at a quarter basis: front left, front right, rear left, and rear right. EC_fl, _fr, _rl, and _rr: electrical conductivity at a quarter basis: front left, front right, rear left, and rear right. AMF: average milk flow. MY_total: total milk yield per day. EC: electrical conductivity from all four quarters. INT: interval between two consecutive milkings. DUR: milking time during a visit in the milking robot. VIS3: at least three visits to the milking robot per day. VIS4: at least four visits to the milking robot per day. KO: knock off of the milking device from at least one udder quarter. 2 Robot: the AMS the cow used. Consecutively numbered across herds. Date: day the cow entered the AMS. INTcl: interval in classes; < 8 h = 1, 8–10 h = 2, and > 10 h = 3. DIMcl: days in milk (DIM) in classes; < 14 = 1, 14–77 = 2, 77–140 = 3, 140–231 = 4, and > 231 = 5. ToD: time of day when the cow visited the AMS in classes; 22:00–04:00 LT = 1, 04:00–10:00 LT = 2, 10:00–16:00 LT = 3, and 16:00–22:00 LT = 4. 3 CA: calving age in month is (calving date–birth date)∕30.4375. where σa2 was the additive genetic variance, σpe2 was the permanent environmental variance, and σe2 was the residual variance. where η was the vector of logits, β was the vector of fixed effects with the corresponding incidence matrix X, u was the vector of random genetic effects with the corresponding incidence matrix Z, p was the vector of random permanent environmental effects with the corresponding incidence matrix W. The binary traits along with their effects are given in Table 2. Heritabilities were calculated using the variance of the logit link function. This implies a correction of the residual variance by factor π2∕3 (Southey et al., 2003). where G was the variance–covariance matrix for genetic effects, Au was an additive genetic relationship matrix for u animals in the whole pedigree, P was the variance–covariance matrix for permanent environmental effects, I was an identity matrix for n cows and r observations, R was the residual variance–covariance matrix, and ⊗ denotes the Kronecker product. 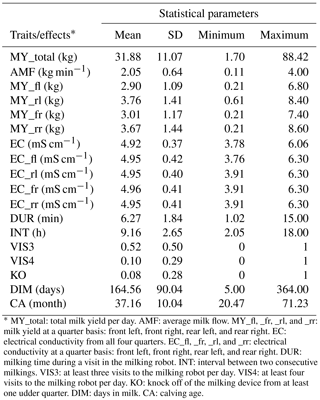 Because milk yield is an important factor influencing AMF, INT, DUR, VIS3, VIS4, and KO, univariate models with and without milk yield as a covariate were compared. Furthermore, bivariate animal models were applied to all trait combinations in order to estimate genetic correlations. Bivariate GLMMs (model III) were applied to binary trait combinations (e.g., VIS3 with KO), bivariate GLMM–linear models (models III and II) for the combination of one binary with one Gaussian trait (e.g., VIS3 with MY), and linear–linear models (model II) for Gaussian–Gaussian trait combinations including EC, AMF, MY_total, INT, and DUR. In some bivariate runs, standard errors (SEs) for genetic correlations were quite large. However, SEs for heritabilities from single-trait animal models were in an acceptable range. Hence, in addition, estimated breeding values (EBVs) from single-trait animal models were correlated, and EBV correlations were compared with genetic correlations. For this purpose, EBVs from the most influential sires with at least five daughters were considered (47 sires). Descriptive statistics for all traits used in this study after data editing are given in Table 3. The degree of individual variation in milking frequencies reflects the variation in milking intervals from 2 to 18 h. Some cows entered the AMS as soon as the minimum “milk allowing interval” has passed, whereas other cows only are milked when they are fetched by the stock person after 14:00 LT. A large variation in the range from 1 to 15 min (average of 6.3 min) was also observed for DUR. Such farm average with 6.3 min for DUR, associated with large individual variation, was observed for all three farms. A fraction of 52 % of all cows visited the AMS more than three times per day (VIS3), but only 10 % of all cows visited the AMS more than four times per day (VIS4). Table 3Descriptive statistics for all traits and effects. * MY_total: total milk yield per day. AMF: average milk flow. MY_fl, _fr, _rl, and _rr: milk yield at a quarter basis: front left, front right, rear left, and rear right. EC: electrical conductivity from all four quarters. EC_fl, _fr, _rl, and _rr: electrical conductivity at a quarter basis: front left, front right, rear left, and rear right. DUR: milking time during a visit in the milking robot. INT: interval between two consecutive milkings. VIS3: at least three visits to the milking robot per day. VIS4: at least four visits to the milking robot per day. KO: knock off of the milking device from at least one udder quarter. DIM: days in milk. CA: calving age. The mean of the udder health indicator EC ranged from 4.92 to 4.96 mS cm−1 on an udder quarter level. Norberg et al. (2004) used an inter-quarter ratio (IQR) for EC and found out that IQR performed better than the absolute conductivity level, in order to distinguish between clinically and subclinically infected cows. In contrast, in early studies, Linzell and Peaker (1975) and Fernando et al. (1982) stated that absolute conductivity and IQR had similar accuracies for the detection of mastitis. In the present study, the analysis focused on the absolute EC, as generated by the AMS, instead of defining inter-quarter ratios. Table 2 shows the significance level of each effect for the traits DUR and INT (results from model I). DUR differed significantly (P < 0.05) for all ToD classes (Fig. 1a), apart from the comparison DUR in ToD 1 and DUR in ToD 3. Cows spent the most time in the milking box between 4 and 10 (= ToD 2). Regarding INT, all ToD classes differed significantly (P < 0.05) from each other (Fig. 1b). The longest interval was found between 10:00 and 16:00 LT (Fig. 1b). This is the time of the day when cows usually eat or lie (Krohn and Munksgaard, 1993; DeVries and Keyserlingk, 2005). The shortest milking interval was found between 04:00 and 10:00 LT. Cows determine their activity rhythm according to environmental factors such as light. They are more active during daytime because of the circadian rhythm – the light change between day and night – which acts as a natural timer (Zeeb und Bammert, 1985). Hopster et al. (2002) demonstrated that low-ranking cows are forced by social competition to visit the AMS at times that are not preferred, particularly during the midnight hours, leading to irregular or long intervals between milkings. There was no significant impact (P > 0.05) of the parity on DUR (Fig. 2a), meaning that cows with different parities spent the same time in the AMS. With regard to the parity, least squares means for INT significantly differed (P < 0.05) (Fig. 2b). Longer INT for first parity cows were probably due to fearfulness and lower ranking; i.e., they were not allowed to visit the AMS in close intervals due to the social herd structure (Ketelaar-de Lauwere, 1996). The INT increase in the fifth parity (Fig. 2b) could be due to reduced mobility of older cows (Alban, 1995). Prescott et al. (1998) found that low-yielding cows did not significantly increase their level of voluntary AMS visits when changing feeding strategies, which indicates further motivations to visit the AMS (for example, curiosity). Figure 1Least squares means for (a) DUR (milking time during a visit in the automatic milking system) (±SE) and (b) INT (interval between two consecutive milkings) (±SE) with dependency on time of the day in classes. Significant differences of least squares means (< 0.05) are indicated with different letters above the bars. Figure 2Least squares means for (a) DUR (milking time during a visit in the automatic milking system) (±SE) and (b) INT (interval between two consecutive milkings) (±SE) with dependency on parity. Significant differences of least squares means (< 0.05) are indicated with different letters above the bars. The heritability was 0.25 for AMF, 0.19 for DUR, 0.07 for INT, 0.03 for KO, 0.08 for VIS3, and 0.05 for VIS4 (Table 4). König et al. (2006) estimated a heritability for milking frequency in the range from 0.16 and 0.27, depending on the statistical modeling. Reported heritabilities for INT were in a range from 0.09 to 0.26 (Carlström et al., 2013). The heritability for INT found in the present study was slightly lower (0.07). Also the heritability for AMF (0.25) was slightly lower compared to estimates based on conventional milking technique data (Santos et al., 2015) but still moderate with relatively small standard errors. The moderate heritabilities for the behavior trait indicators DUR and AMF indicate the possibilities for AMS milkability improvements via breeding. Heritabilities estimated with univariate models with and without milk yield as a covariate were comparable, with slightly larger heritabilities for some traits in models with milk yield as a covariate (0.17 for VIS3, 0.08 for VIS4, and 0.18 for INT). Heritabilities and additive genetic variance show that besides environmental components such as food, fetching and machine calibration (e.g., restriction of the INT) there is a genetic component behind the traits. Research showed that there is a possibility to automatically record behavior traits (König et al., 2006; Schwartzkopf-Genswein et al., 2012). The characterization of the traits in the context of animal welfare implies further studies including temperament and behavior tests as validated in animal ethology (e.g., Ebinghaus et al., 2017). 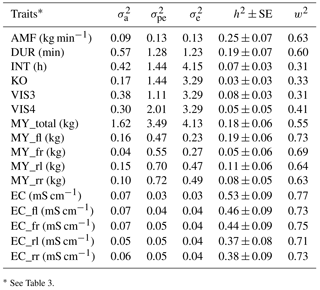 Table 4Heritabilities (h2) with their corresponding SEs, additive genetic variances (σa), permanent environmental variances (σpe2), residual variances (σe2), and repeatabilities (w2) for all traits. Heritabilities for EC from different udder quarters varied between 0.37 and 0.46 (Table 4). For udder health indicators, Juozaitienè et al. (2015) estimated a heritability of 0.51 for EC, reflecting heritabilities for corresponding traits from our study. The moderate to large heritabilities suggest the inclusion of EC into udder health indices. From such a perspective, additional value is generated when treating each quarter separately, in order to identify pathological changes (Umstätter, 2002). The benefit would be in the use of information for monitoring and managing animal health (Kramer et al., 2013). The heritability for milk yield per day (MY_total) was 0.18. For the different udder quarters, heritabilities ranged from 0.05 for MY_fr to 0.19 for MY_fl (Table 4). Tančin et al. (2006) suggested productivity improvements via consideration of specific udder quarter information. Also in the present study, identical traits from different udder quarters seem to have a different genetic background in terms of genetic (co)variance components, suggesting udder-quarter-specific selection strategies. As one example, sires will have udder-quarter-specific breeding values, allowing specific udder quarter improvements from a mating perspective. Information at an udder quarter level might be valuable information in future precision dairy farming applications. Eastwood et al. (2004) defined precision dairy farming as “the use of information technologies for assessment of fine-scale animal and physical resource variability aimed at improved management strategies for optimizing economic, social, and environmental farm performance.” In this regard, electrical devices used in precision dairy farming analyzed different milk characteristics and produced indicators based on temperature, conductivity, milk quantity, production balance across quarters, or milk flow (Boichard and Brochard, 2012). Genetic correlations (rg) as well as EBV correlations (rEBV) between AMF and DUR were negative (−0.88 and −0.63, respectively) (Table 5), indicating that fast milking cows, i.e., cows with a good temperament, spent less time milking in the milking robot. Hence, genetic associations between AMF and DUR confirm farmers' observations at a phenotypic scale. Both temperament indicators (milking time and milk flow) are economically important, because they determine AMS capacity and efficiency. Explanations for the strong genetic relationship between AMF and DUR with acceptable standard errors can be as follows. The combative behavior of cows causes physiological changes, i.e., affecting the oxytocin hormone level and norepinephrine concentrations (Kondo and Hurnik, 1988), and in ongoing lactation, reduced milk flow. Szentléleki et al. (2015) reported a significantly higher milking speed if cows were calm in the pre-milking process compared to nervous cows. Another explanation is due to the fact that cows with faster AMF need less time to be milked and therefore spend less time in the milking box. Table 5Genetic correlations among behavior indicator traits (above the diagonal with standard errors in brackets) and corresponding correlations among breeding values from bulls with at least five daughters (below the diagonal). Table 6Genetic correlations (rg) with standard errors and breeding value correlations (rEBV) considering bulls with at least five daughters between milk yield and behavior indicator traits. * See Table 1. MY_total: total milk yield per day from the AMS. Table 7Genetic correlations (rg) with standard errors (in brackets) and breeding value correlations (rEBV) considering bulls with at least five daughters between behavior indicator traits and electrical conductivity of the udder (EC). The genetic correlation between DUR and KO was also negative (rg= −0.25), with less knock offs of the milking device being associated with longer milk ejection. A hypothesis would be that nervous or fearful cows show more knock offs, leading to a shorter milk ejection because of negative impact on oxytocin release. As outlined by Rousing et al. (2004), kicking and stepping during milking resulted in knock off of the milking device, incomplete milking, and reduced milk yield. Stressed animals not only require more handling during milking (Rushen et al., 1999) but they may kick off the milking device during milking. Fearfulness in cows can result in slower milk let down and milk retention (Munksgaard et al., 2001). EBV correlations between DUR and KO were close to zero. EBV correlations were only based on EBV from influential sires, but due to EBV accuracies lower than 1, rEBV values are “less extreme”, i.e., an underestimation of genetic correlations (Calo et al., 1973). Low positive correlations were estimated between VIS3 and DUR (rg= 0.28, rEBV= 0.11), and between VIS4 and DUR (rg= 0.37, rEBV= 0.12), indicating that an increase of visiting frequencies was associated with a longer milking duration per visit. Extremely long DUR may reflect an inhibited milk flow, being supported on the genetic scale with rg= −0.88 between DUR and AMF. The genetic correlation between AMF and INT was positive, but close to zero (rg= 0.14, rEBV= 0.02), and estimated with quite large standard errors. Accordingly, Hogeveen et al. (2001) found that a longer milking interval was associated with an increase in the milk flow rate (on a phenotypic level), independent of the milk performance level. An increase in milking speed (e.g., AMF) will lead to a reduction of total milking time per cow, with a positive impact on AMS capacity and AMS efficiency (Gäde et al., 2007). INT and KO were negatively correlated (rg= −0.19, rEBV= −0.13), meaning that shorter intervals were genetically associated with more knock offs. This might be associated with udder deformations, resulting in improper attachment of the milking device. Also, the correlation between DUR and INT was slightly negative (rg= −0.15, rEBV= −0.09), indicating that shorter intervals were associated with a longer milking duration. Milking duration depends not only on the amount of milk, but also on the temperament of the cow. Kaihilahti et al. (2006) stated that 19 % of the cows kicked off the teat cups during milking, with an impact on milk duration and milking time independent from the milk yield level. In most cases, EBV correlations were in agreement with genetic correlations. As indicated in Table 6, MY_total was positively correlated with DUR (rg= 0.87; rEBV= 0.25), with VIS3 (rg= 0.49; rEBV= 0.52), and with VIS4 (rg= 0.80; rEBV= 0.47). These findings suggest that sires with high EBV for milk yield tend to have daughters with longer milking duration but also daughters that come easily or voluntary into the milking box. These findings were also reported by König et al. (2006) when defining milking frequencies as a behavior indicator trait. In their models, milk yield was used as covariate in statistical models, showing that milk yield was not the only force determining voluntary visits. Kazlauckas et al. (2005) compared two groups of mice (with high and low exploration of an object) and concluded that although both groups were driven by food motivation, high exploratory mice showed increased locomotion. Results from such research, as conducted in other species, support our hypothesis that there are additional motivations to visit the AMS apart from the offered food. In accordance with Nixon et al. (2009), selection for increased milk production implies an increase of milking frequencies. Associations between calm temperament and high milk production were shown by Lawstuen et al. (1988) and Breuer et al. (2000). Also across species, temperament and behavior were favorably correlated with productivity. For example, in pigs, selection for calm temperament simultaneously improved carcass and meat quality traits (Reverter et al., 2003). Nevertheless, the definition of temperament differed, complicating the comparison of correlation coefficients from different studies. Accordingly, Hoppe et al. (2010) found that selection towards improved temperament in beef cattle simultaneously improved production traits. 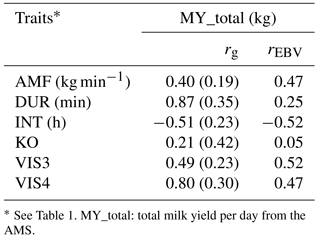 In the present study, milk yield was positively correlated with AMF (rg= 0.40; rEBV= 0.47), indicating that higher productivity was associated with a faster milk flow, supporting previous results from conventional milking systems (Santos et al., 2015). 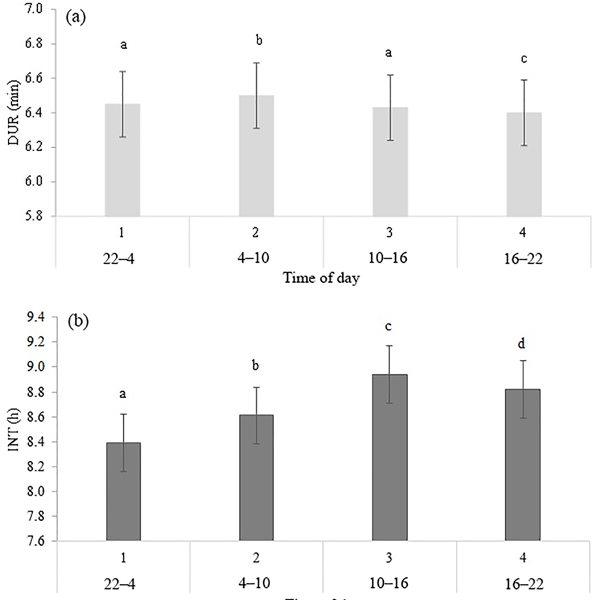 Selection towards desired temperament had a positive effect on the number of visits and on the duration in the milking box, as well as on milk production and milk efficiency (i. e., AMF). The correlation between MY_total and KO (rg= 0.21; rEBV= 0.05) was moderately positive, indicating antagonistic genetic relationships from a breeding perspective. Knocking off the milking device has different reasons, e.g., udder morphology, mastitis, or the temperament of the cow. More aggressive cows produce more knock offs of the milking device due to the agitation in the milking box. The behavior indicator INT was negatively correlated with MY_total (rg= −0.51; rEBV= −0.52). Shorter milking intervals, indicating a good individual behavior or temperament, were also associated with higher milk production per cow and hour (Hogeveen et al., 2001). Extended milking intervals cause practical problems in AMS, and so far, direct selection tools are missing. Nevertheless, some genetic correlation standard errors were quite large, encouraging further analyses in this regard. Genetic correlations among all behavioral traits and EC were positive, but also close to zero (Table 7). The strongest positive genetic correlation was found between INT and EC (0.19), indicating that longer milking intervals had a negative impact on animal health, or that animals having health problems have longer milking intervals. The number of AMS visits (VIS3) was positively correlated with EC (rg= 0.15). The risk of bacterial invasion into the mammary gland increased with the number of milkings per day (Hogeveen et al., 2001). The genetic correlation between AMF and EC was low, but again positive (rg= 0.11), confirming the unfavorable relationships between temperament and health traits (Santos et al., 2015). Increased AMF is also due to decreased tension of the teat sphincter. A weak sphincter decreases resistance to infection of the udder by specific major pathogens, causing clinical mastitis (Boettcher et al., 1998). Hence, from an animal breeding perspective, AMF should be treated as a trait with an intermediate optimum, as already suggested by Santos et al. (2015). Generally weak genetic correlations suggest that breeding on behavior indicator traits does not impair health indicator traits. Regarding the correlations between AMS behavior indicator traits with EC, all EBV correlations were close to zero, and partly differed in sign from genetic correlations. The genetic correlations between AMS behavior traits with other functional traits were estimated with quite large standard errors, suggesting ongoing studies with additional data. This was a first pilot study to estimate genetic parameters for alternative functional traits based on data automatically generated by the AMS, free from subjective evaluations of classifiers. Furthermore, the applicability of AMS traits as indicators for dairy cow behavior and health was verified. From such a perspective, with the inclusion of milk yield as a covariate in the statistical model, genetic variances of AMS traits even increased. The increase of genetic variance and heritability suggests a behavior or temperament background, instead of milk yield being the only force behind these traits, e.g., AMS visits. Behavior traits derived from data from the AMS like AMF and DUR had a moderate heritability. Heritabilities for the other AMS behavior indicator traits (INT, KO, VIS3, and VIS4) were quite small. Regarding genetic relationships, an increase of AMF, a decrease in DUR, and a decrease of INT might contribute to desired behavior without losing genetic gain for production. Different EC heritabilities for different udder quarters allow udder-quarter-specific breeding strategies. Hence, based on the genetic (co)variance components from the present study, results are encouraging to breed cows for AMS systems based on AMS data, but it is imperative to have a precise validation based on larger datasets. The present study is part of the LOEWE research cluster “Animals – Humans – Society: Interdisciplinary Animal Studies” at the University of Kassel and has been funded by the Hessian State Ministry of Higher Education, Research and Arts. Alban, L.: Lameness in Danish dairy cows: frequency and possible risk factors, Prev. Vet. Med., 22, 213–225, 1995. Barkema, H. W., von Keyserlingk, M. A. G., Kastelic, J. P., Lam, T. J. G. M., Luby, C., Roy, J. P., and Kelton, D. F.: Invited review: Changes in the dairy industry affecting dairy cattle health and welfare, J. Dairy Sci., 98, 7426–7445, 2015. Boettcher, P. J., Dekkers, J. C. M., and Kolstad, B. W.: Development of an udder health index for sire selection based on somatic cell score, udder conformation, and milking speed, J. Dairy Sci., 81, 1157–1168, 1998. Boichard, D. and Brochard, M.: New phenotypes for new breeding goals in dairy cattle, Animal, 6, 544–550, 2012. Breuer, K., Hemsworth, P. H., Barnett, J. L., Matthews, L. R., and Coleman, G. J.: Behavioural response to humans and the productivity of commercial dairy cows, Appl. Anim. Behav. Sci., 66, 273–288, 2000. Café, L. M., Robinson, D. L., Ferguson, D. M., McIntyre, B. L., Geesink, G. H., and Greenwood, P. L.: Cattle temperament: persistence of assessments and associations with productivity, efficiency, carcass and meat quality traits, J. Anim. Sci., 89, 1452–1465, 2011. Calo, L. L., McDowell, R. E., Van Vleck, L. D., and Miller, P. D.: Genetic aspects of beef production among Holstein-Friesians pedigree selected for milk production, J. Anim. Sci., 37, 676–682, 1973. Carlström, C., Pettersson, G., Johansson, K., Strandberg, E., Stålhammar, H., and Philipsson, J.: Feasibility of using automatic milking system data from commercial herds for genetic analysis of milkability, J. Dairy Sci., 96, 5324–5332, 2013. 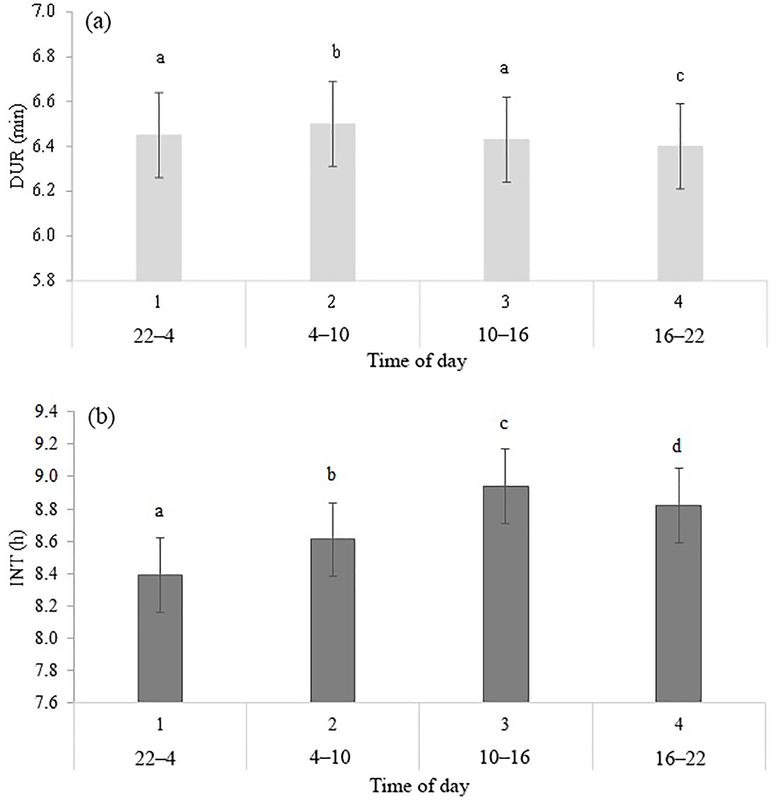 DeVries, T. J. and von Keyserlingk, M. A.: Time of feed delivery affects the feeding and lying patterns of dairy cows, J. Dairy Sci., 88, 625–631, 2005. DHV: http://www.holstein-dhv.de/aktuelles/rzrobot.html (last access: 16 March 2017), 2014. Eastwood, C., Chapman, D., and Paine, M.: Precision dairy farming-taking the microscope to dairy farm management, in: Current Topics in Dairy Production, edited by: Fulkerson, W., Dairy Research Foundation Symposium, Camden, Australia, 2004. Ebinghaus, A., Ivemeyer, S., Lauks, V., Santos, L., Brügemann, K., König S., and Knierim, U.: How to measure dairy cows' responsiveness towards humans in breeding and welfare assessment? A comparison of selected behavioural measures and existing breeding traits, Appl. Anim. Behav. Sci., 196, 22–29, 2017. Fernando, R. S., Rindsig, R. B., and Spahr, S. L.: Electrical conductivity of milk for detection of mastitis1, J. Dairy Sci., 65, 659–664, 1982. Gäde, S., Stamer, E., Bennewitz, J., Junge, W., and Kalm, E.: Genetic parameters for serial, automatically recorded milkability and its relationship to udder health in dairy cattle, Animal, 1, 787–796, 2007. Gilmour, A. R., Thompson, R., and Cullis, B. R.: Average information REML: an efficient algorithm for variance parameter estimation in linear mixed models, Biometrics, 51, 1440–1450, 1995. Gutiérrez-Gil, B., Ball, N., Burton, D., Haskell, M., Williams, J. L., and Wiener, P.: Identification of quantitative trait loci affecting cattle temperament, J. Hered., 99, 629–638, 2008. Harms, J. and Wendl, G.: Influence of cow traffic on milking and animal behaviour in a robotic milking system, in: Automatic Milking, edited by: Meijering, A., Hogeveen, H., and de Koning, C. J. A. M., Wageningen Academic Publishers, Wageningen, 492–493, 2004. Haskell, M. J., Simm, G., and Turner, S. P.: Genetic selection for temperament traits in dairy and beef cattle, Front. Genet., 5, 368, https://doi.org/10.3389/fgene.2014.00368, 2014. Hogeveen, H., Ouweltjes, W. C. J. A. M., De Koning, C. J. A. M., and Stelwagen, K.: Milking interval, milk production and milk flow-rate in an automatic milking system, Livest. Prod. Sci., 72, 157–167, 2001. Hoppe, S., Brandt, H. R., König, S., Erhardt, G., and Gauly, M.: Temperament traits of beef calves measured under field conditions and their relationships to performance, J. Anim. Sci., 88, 1982–1989, 2010. 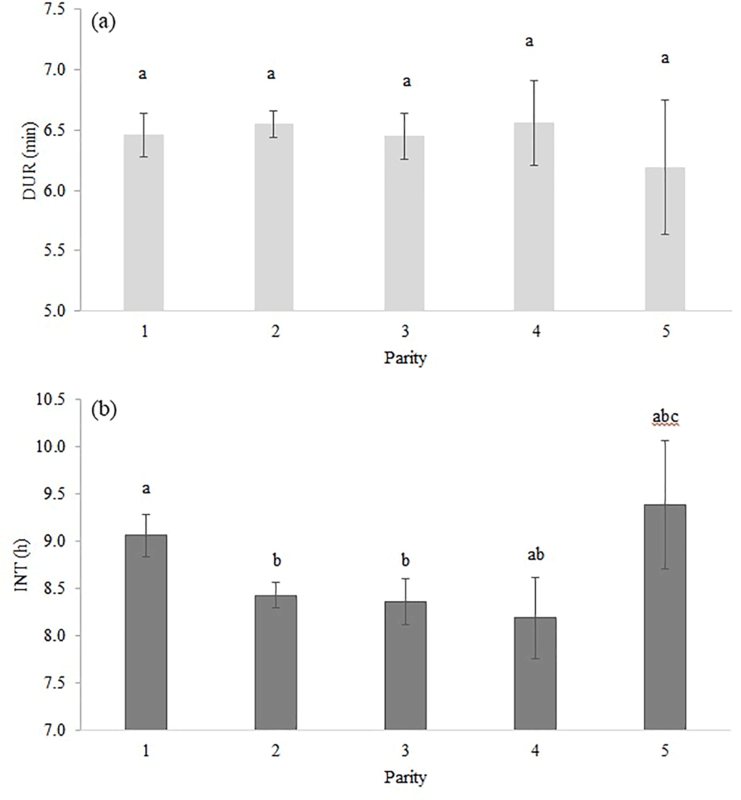 Hopster, H. R. M. B., Bruckmaier, R. M., Van der Werf, J. T. N., Korte, S. M., Macuhova, J., Korte-Bouws, G., and Van Reenen, C. G.: Stress responses during milking; comparing conventional and automatic milking in primiparous dairy cows, J. Dairy Sci., 85, 3206–3216, 2002. Huth, F. W.: Die Laktation des Rindes: Analyse, Einfluss, Korrektur (“ The lactation of cattle: analysis, influence, correction”), Ulmer Verlag, Stuttgart, 295 pp., 1995. Jensen, P., Buitenhuis, B., Kjaer, J., Zanella, A., Mormède, P., and Pizzari, T.: Genetics and genomics of animal behaviour and welfare – Challenges and possibilities, Appl. Anim. Behav. Sci., 113, 383–403, 2008. 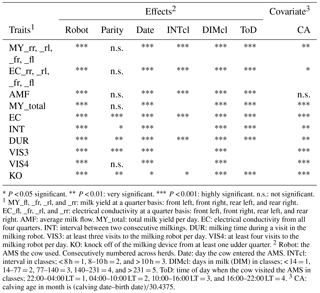 Juozaitienè, V., Juozaitis, A., Brazauskas, A., Žymantienè, J., Žilaitis, V., Antanaitis, R., Stankevičius, R., and Bobinienè, R.: Investigation of electrical conductivity of milk in robotic milking systems and its relationship with milk somatic cell count and other quality traits, JVE International Ltd., Kaunas, Lithuania, ISS Print 2335–2124, ISSN Online 2424–4635, 2015. 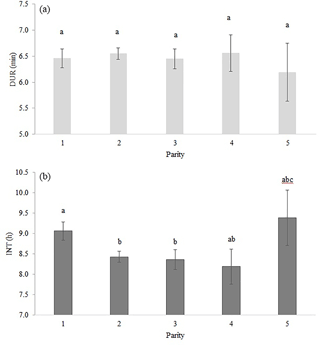 Kaihilahti, J., Raussi, S., Khalilija, H., and Sariola, J.: Cow behaviour and disturbances at automatic concentrate feeder, Agr. Eng., 543–544, 2006. Kazlauckas, V., Schuh, J., Dall'Igna, O. P., Pereira, G. S., Bonan, C. D., and Lara, D. R.: Behavioral and cognitive profile of mice with high and low exploratory phenotypes, Behav. Brain Res., 162, 272–278, 2005. Ketelaar-de Lauwere, C. C., Devir, S., and Metz, J. H. M.: The influence of social hierarchy on the time budget of cows and their visits to an automatic milking system, Appl. Anim. Behav. Sci., 49, 199–211, 1996. Ketelaar-de Lauwere, C. C., Hendriks, M. M. W. B., Metz, J. H. M., and Schouten, W. G. P.: Behaviour of dairy cows under free or forced cow traffic in a simulated automatic milking system environment, Appl. Anim. Behav. Sci., 56, 13–28, 1998. Kondo, S. and Hurnik, J. F.: Behavioral and physiological responses to spatial novelty in dairy cows, Can. J. Anim. Sci., 68, 339–343, 1988. König, S., Köhn, F., Kuwan, K., Simianer, H., and Gauly, M.: Use of repeated measures analysis for the evaluation of genetic background of dairy cattle behavior in automatic milking systems, J. Dairy Sci., 89, 3636–3644, 2006. Kramer, M., Erbe, M., Bapst, B., Bieber, A., and Simianer, H.: Estimation of genetic parameters for individual udder quarter milk content traits in Brown Swiss cattle, J. Dairy Sci., 96, 5965–5976, 2013. Krohn, C. C. and Munksgaard, L.: Behaviour of dairy cows kept in extensive (loose housing/pasture) or intensive (tie stall) environments II. Lying and lying-down behaviour, App. Anim. Behav. Sci., 37, 1–16, 1993. Lawstuen, D. A., Hansen, L. B., Steuernagel, G. R., and Johnson, L. P.: Management Traits Scored Linearly by Dairy Producers, J. Dairy Sci., 71, 788–799, 1988. Le Neindre, P., Trillat, G., Sapa, J., Menissier, F., Bonnet, J. N., and Chupin, J. M.: Individual differences in docility in Limousin cattle, J. Anim. Sci., 73, 2249–2253, 1995. Linzell, J. L. and Peaker, M.: Efficacy of the measurement of the electrical conductivity of milk for the detection of subclinical mastitis in cows: detection of infected cows at a single visit, Brit. Vet. J., 131, 447–461, 1975. Madsen, P. and Jensen, J.: A user's quide to DMU, a package for analyzing multivariate mixed models, Danish Institute of Agricultural Sciences (DIAS), Tjele, Denmark, 2000. Miglior, F., Muir, B. L., and Van Doormaal, B. J.: Selection indices in Holstein cattle of various countries, J. Dairy Sci., 88, 1255–1263, 2005. Munksgaard, L., DePassillé, A. M., Rushen, J., Herskin, M. S., and Kristensen, A. M.: Dairy cows' fear of people: social learning, milk yield and behaviour at milking, Appl. Anim. Behav. Sci., 73, 15–26, 2001. 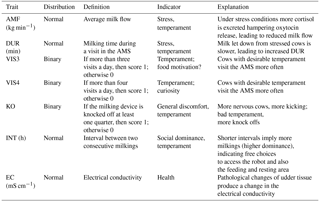 Norberg, E., Hogeveen, H., Korsgaard, I .R., Friggens, N. C., Sloth, K. H. M. N., and Løvendahl, P.: Electrical conductivity of milk: ability to predict mastitis status, J. Dairy Sci., 87, 1099–1107, 2004. Nixon, M., Bohmanova, J., Jamrozik, J., Schaeffer, L. R., Hand, K., and Miglior, F.: Genetic parameters of milking frequency and milk production traits in Canadian Holsteins milked by an automated milking system, J. Dairy Sci., 92, 3422–3430, 2009. Oltenacu, P. A. and Algers, B.: Selection for increased production and the welfare of dairy cows: are new breeding goals needed?, AMBIO, 34, 311–315, 2005. Prescott, N. B., Mottram, T. T., and Webster, A. J. F.: Relative motivations of dairy cows to be milked or fed in a Y-maze and an automatic milking system, Appl. Anim. Behav. Sci., 57, 23–33, 1998. Pryce, J. E., Coffey, M. P., and Brotherstone, S.: The genetic relationship between calving interval, body condition score and linear type and management traits in registered Holsteins, J. Dairy Sci., 83, 2664–2671, 2000. Reverter, A., Johnston, D. J., Ferguson, D. M., Perry, D., Goddard, M .E., Burrow, H. M., Oddy, V. H., Thompson, J. M., and Bindon, B. M.: Genetic and phenotypic characterization of animal, carcass, and meat quality traits from temperate and tropically adapted beef breeds. 4. Correlations among animal, carcass, and meat quality traits, Crop Pasture Sci., 54, 149–158, 2003. 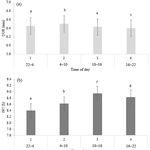 Rousing, T., Bonde, M., Badsberg, J. H., and Sørensen, J. T.: Stepping and kicking behavior during milking in relation to response in human–animal interaction test and clinical health in loose housed dairy cows, Livest. Prod. Sci., 88, 1–8, 2004. Rushen, J., De Passille, A. M. B., and Munksgaard, L.: Fear of People by Cows and Effects on Milk Yield, Behavior, and Heart Rate at Milking, J. Dairy Sci., 82, 720–727, 1999. Santos, L., Brügemann, K., Simianer, H., and König, S.: Alternative strategies for genetic analyses of milk flow in dairy cattle, J. Dairy Sci., 98, 8209–8222, 2015. Schwartzkopf-Genswein, K. S., Shah, M. A., Church, J. S., Haley, D. B., Janzen, K., Truong, G., Atkins, R. P., and Crowe, T. G.: A comparison of commonly used and novel electronic techniques for evaluation cattle temperament, Can. J. Anim. Sci., 92, 21–31, 2012. Sewalem, A., Kistemaker, G. J., and van Doormaal, B. J.: Bayesian inferences for milking temperament in Canadian Holsteins. In Proceedings of the 7th World Congress on Genetics Applied to Livestock Production, Montpellier, France, August, 2002, Session 1, Institut National de la Recherche Agronomique (INRA), 1–4, 2002. Southey, B. R., Rodriguez-Zas, S. L., and Leymaster, K. A.: Discrete time survival analysis of lamb mortality in a terminal sire composite population, J. Anim. Sci., 81, 1399–1405, 2003. Szentléleki, A., Nagy, K., Széplaki, K., Kékesi, K., and Tőzsér, J.: Behavioural responses of primiparous and multiparous dairy cows to the milking process over an entire lactation, Ann. Anim. Sci., 15, 185–195, 2015. Tančin, V., Ipema, B., Hogewerf, P., and Mačuhová, J.: Sources of variation in milk flow characteristics at udder and quarter levels, J. Dairy Sci., 89, 978–988, 2006. Umstätter, C.: Tier-Technik-Beziehung bei der automatischen Milchgewinnung (“Animal-Technical Interaction in the automatic milk production”), Doctoral dissertation, Humboldt-Universität zu Berlin, Landwirtschaftlich-Gärtnerische Fakultät, Berlin, Germany, 2002. Vosman, J. J., de Jong, G., and Eding, H.: Breeding of cows suitable for an automatic milking system, Interbull bulletin No 48. Berlin, Germany, 2014. Zeeb, K. and Bammert, J.: Zur Synchronität des Rinderverhaltens unter verschiedenen Haltungsbedingungen (“The synchronicity of cattle behavior under different conditions”), Züchtungskunde, 57, 348–356, 1985. The impact of the milking technique on the individual animal and the reaction of the animal on the technique were investigated. With the use of objectively recorded data from automatic milking systems (AMSs), auxiliary traits that reflect animal behavior in the milking system were defined, free from subjective impressions of classifiers. There is an apparent possibility to breed cows for AMS systems based on AMS data, though it is imperative to have further validation based on larger datasets.